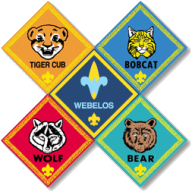 Helotes Scout Pack 888's first concern is the protection of our young cub scouts and that includes the protection of their personal information. In order to protect our children, Pack 888 strictly follows all BSA (Boy Scouts of America) rules concerning website safety for your children. The BSA has adopted COPPA (the Childrens Online Privacy Protection Act) to help provide security to our members. Public Disclosures: No information will ever be published on this website without prior parental approval. Even then, the only "information" that would be posted may be a picture and a first name of the Scout as a caption (First names are usually not needed, mainly just pictures of the "Scouts being Scouts"). If information is posted that a parent wants to be removed, it will be removed upon request of the parent. Personal Identifiable Information about youth members will NEVER be posted including (but not limited to): Full names, addresses, email addresses, or phone numbers. No information will ever be sold. Any collected information will be readily available to ONLY the Webmaster and the Cubmaster.